As a teacher, I love snow days - I get to sleep in, grade papers in my pajamas, watch television, shovel out the driveway at my leisure, and enjoy the winter wonderland without worrying about having to drive in it. The downside to snow days (aside from having to go to school later and later in June) is the isolation. Not driving means spending most of the day by myself, and it gets old. Luckily, since we live in town, I can trudge up to the co-op or the library if I get lonely, but most of my friends and future coho neighbors live out a ways and don't have that option. Even though it pales in comparison to face-to-face contact, at least the internet allows us to stay connected during those stormy afternoons. In honor of that exciting, wintry daydream (which may be a reality by next winter! 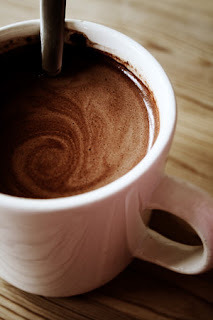 ), I'm sharing my recipe for hot cocoa - a perfect winter treat, to be made in a big pot sitting on a wood stove, or in smaller amounts to be shared among a few friends (or hoarded all for yourself). This uses a classic Maine sweetener - maple syrup - instead of cane sugar. Share it with your friends and neighbors, and perhaps this time next winter, you can stop by our common house and have a cup before going sledding or snow hiking with us. 1/3 - 1/2 C (real!) maple syrup - use more if you like it sweeter! In a decently sized pot or saucepan with a wide bottom (easier for whisking), whisk the cocoa powder and salt together. Add the hot water and whisk until ingredients are combined, then add the butter, vanilla and the maple syrup. Whisk until smooth, with the burner on simmer. Add the milk, whisking until combined and fully warm. Now comes an important step – the pre-taste-test. Taste a bit of it to see how sweet it is. You can always add more sugar or maple syrup if you want it sweeter, and more milk if you don’t. You can adjust the cocoa amount, too, if you want. It's very flexible. Just keep tasting until you have it the way you like it. If you’re going to double the recipe, just keep tasting it as you go to make sure proportions are right. Garnish with marshmallow or whipped cream if that’s your thing, but it's good straight up with no distractions. I realize what made our Valentines Open House so special yesterday was that we were so relaxed, like an extended family on a winter Sunday afternoon, hanging around the house. It wasn't an exciting hubbub where we were on our best behavior for guests, we were just comfortable, and our visiting families settled in with us. The musicians didn't perform for an event, they just gathered round and sang and played for each other. Their joy rippled throughout the room. A creative camaraderie grew around the scatter of lacy red heart doilies, glue sticks, cupid stickers, and ribbons. Our bonfire makers stoked the fire, the cocoa makers stirred the brew, and we were at home in good company. What a perfect way for someone to see if this is how they might want to live. What an affirmation that this is how we are choosing to live in community, already. I thank each of you for what you brought to the day. As the snow began to pile up on my roof that first winter, I thought the icicles forming on the edge of the roof were pretty cool — a Currier & Ives print come to life. Then my kitchen ceiling started leaking. I was mystified until one of the old Mainers I worked with explained the physics of ice dams. On any roof that’s inadequately insulated or ventilated, some heat from the house will escape through it. When there’s snow on the roof, that heat melts the layer of snow in contact with it, which then runs down the (warm-ish) roof until it reaches the eaves. At that point, being beyond the area of the roof where escaping heat keeps it liquefied, it re-freezes and forms a little dam made of ice. Drop by drop, this dam thickens and works its way backward up the roof until it reaches a point where it can seep beneath the roofing material and make its way into the house. Depending on the pitch of the roof and how far the water has to go before reaching that point, you might wind up with an ice dam six to ten inches thick. Assuming you don’t want to climb up on the roof with a shovel, there are two ways of dealing with this: install electric de-icing cables on the edge of the roof (expensive and not very green), or get a roof rake. A roof rake is basically a long pole with a plastic or metal scraper blade attached to the end. Instead of lifting and tossing the snow, as you would do with a shovel, you just muckle on to a clump with the scraper and use the pole to pull it off the edge of the roof. If your house isn’t too tall, you might be able to do this standing on the ground (safe). In my case, I get to do part of it standing on a ladder, and part of it standing on the roof of my woodshed (not safe). 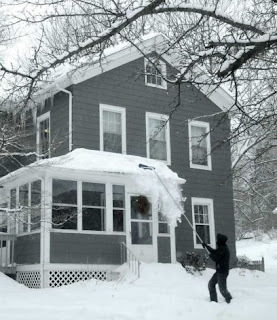 If you rake your roof immedialtely after the snow falls, you won’t have any problems. Wait a day, and you’ve got the start of a dam. Now, besides raking the roof, you’ve got to break the dam apart. I use a small hand axe, and try really hard not to chop holes in my roof. In certain circumstances it can be a sort of meditative process. Most of the time it’s ulcer-inducing. And hard on the roof. Metal roofs are less problematic than shingles because they’re slipperier, and any ice dams that form are more likely to break loose on their own. Better still are roofs that are properly insulated and ventilated. You know you’re looking at such a roof when you see a load of snow atop it and no icicles whatsoever along the edges. It’s a beautiful thing. My yoga studies started over twenty-six years ago, jeez maybe around thirty. My very first yoga class was at an urban studio in St. Louis near Washington University. It was bare bones zen grunge decor. I was the youngest person there and we took cold showers halfway through the asanas. When I ask myself what inspired me to first go to yoga class I think it may have been Lilias, the woman who did yoga on the PBS channel. Even though as teenager I made fun of her reflexively to bolster my own wobbly sense of social status as a young female primate, I simultaneously wondered if she got her courage to appear in tights and leotard on TV from doing yoga. I remember liking it immediately. It was weird, but it was also both challenging and phat in a sensory way. What I mean by that is that it absorbed me completely while I was doing it. And my body and brain were equally absorbed. No part of me felt left out just watching, or already anticipating what came next. It put me in the zone. Over three decades my practice has lapsed many times, for months, even a year once or twice. But I kept returning because no other do-anywhere, solo activity so consistently gave me that indescribably sweet feeling of being at home again in my own body. A feeling similar to my experience as a kid of running and playing outside all day, finally coming inside fabulously relaxed and happy, full of sunshine, chlorophyll vapors and oxygen. I know few adults who can afford to spend several days a week climbing trees, playing kickball, wrestling in the grass, riding bicycles, etc. to their hearts' content. Yoga class 1+ times per week and 15 to 45 minutes on my own daily give me that feeling many days. Although my body has gained flexibility over the years, that seems inconsequential beside the expanded sense of intimacy with my body and my mind. I am proprioceptively bigger: that means athletically introverted. Yoga practice also gives me a deeply cared for sense of well-being. It is difficult to write about something that is necessarily experiential. Yoga must be experienced to be understood and then after 6 to 9 months of going to class with a teacher you like and trust, you realize one day that a little light has gone on somewhere. But where? In your mind? 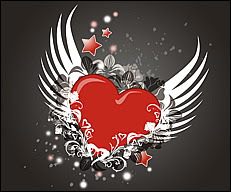 Your heart? Your no longer stiff hips? Your SOUL?! What?!! It is a very curious awareness of self, but at the same time not self. Because it is awareness of breath, empty space inside, and internal geography that feels more Micro-Intra-Galactic Wild than SELF. 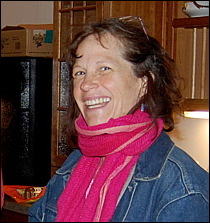 I have become more Mary O'Herin, the fiery, sensitive, spontaneous, watery nature. At the same time I have become less attached to being Mary as I sink deeper into the being I call myself. Just be-ing is the greatest expression of my true nature, knowing by feeling it that I am a tiny part of something much bigger: the Micro-Intra-Galactic Wilderness Alliance. You see it starts to sound so, so... mystical and OUT there, but my experience and what I am trying to describe is distinctly clear and defined by measurable parameters of flesh and oxygen in gaseous and liquid form. I understand all the weird tricks yogis are known for: they were attempting to advertise the fantastic results of yoga. Advertising savvy is not a benefit of yoga, by the way. I do not think yoga is the only way to enter the Micro-Intra-Galactic wilderness within. There are many paths. A yogi from Chicago cited yoga as one of the Healing Salves which are loosely: singing, dancing, laughing, exercise (enjoyed), diet, nature, silence, and story-telling. His recommendation was to have some personal recipe of them all in one's life. That, my friend, is my best attempt for now to explain why I am so devoted to yoga. The word Yoga means union: the mind is calmed, the body is enlivened, and they meet one another in the spaciousness of the soul as their electro-magnetic currents blend smoothly. I added that last bit. Namaste! I bow to the Divine Flame within You.